Let’s hear it for Chattanooga’s mountains, lakes, caverns, and taverns. While Atlanta, Georgia, 100 miles South, is a vital party town and Bacchanalia’s restaurant boasts great oysters and lobsters, the home of the Braves is not well known for its wealth of microbrews. Instead, I spent July ‘98 in the Peach State with cousins, parents, kids, and wife in beautiful Georgia Pines. Tucked away in a few woodsy cabins, we hiked cliffs by day and barbecued at night. Though the rural area offered very little by way of fine beers, I did discover the better than average Georgia Wild Raspberry Wheat Ale and the not-so-thick Mississippi Mud Black & Tan, which, to my surprise, was actually brewed way up yonder in Utica, New York (reviewed in Beer Index). Meanwhile, nearby Chattanooga, Tennessee, had its charming small town rewards. 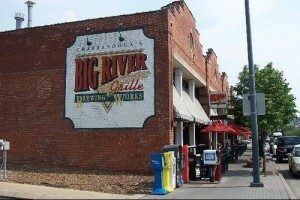 THE BIG RIVER GRILLE & BREWERY down from famous Chattanooga Choo Choo’s made fine handcrafted bitters. And those nifty mining caverns with geysers we visited along the way were magnificent.